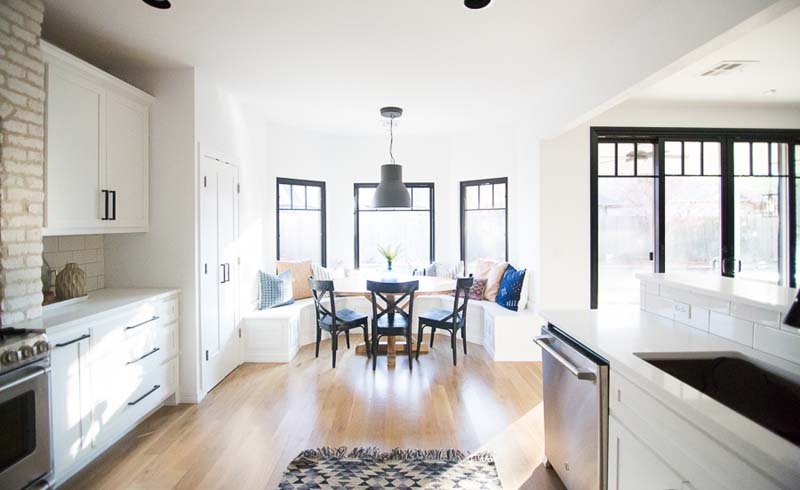 Kitchen banquettes can be customized to integrate seamlessly into a layout, add hidden storage and do what they’ve always done best: provide an intimate spot to gather and connect. 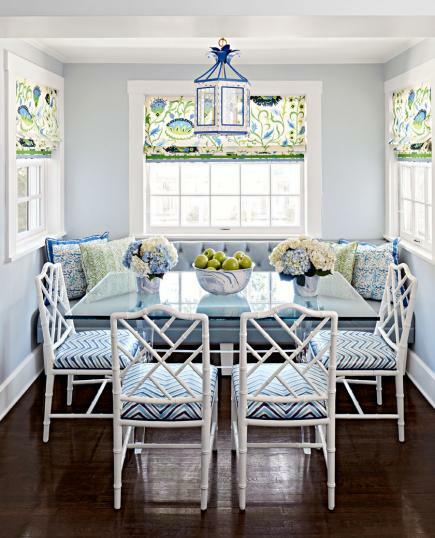 Here are seven ideas for adding kitchen seating banquette-style. If space is tight, opt for a pedestal table that leaves plenty of leg room. It’s a smart choice for this luxe corner banquette. While chairs require more clearance, the bench, upholstered in durable faux leather, sits flush against the wall. Tip: Plan for a 36-inch walkway between table edges and any work surfaces, like an island. If chairs are at the table, widen the space to 44 inches. A built-in storage wall elevates this traditional-style banquette from breakfast nook to multipurpose corner. Drawers built into bench seats stow linens. Mixing dark and light finishes creates elegant contrast. 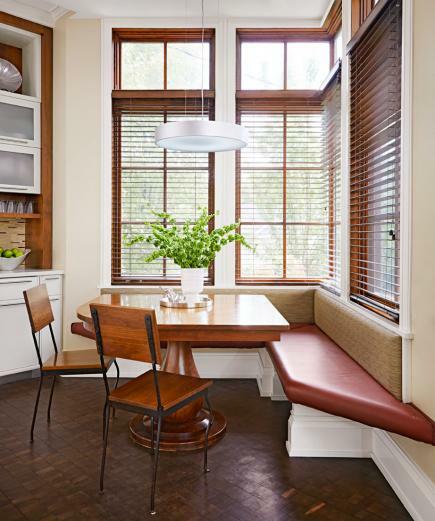 A bumped-out alcove keeps a banquette away from a kitchen’s workspace. The U-shape configuration works well when there isn’t enough space around a table to slide chairs in and out. To encourage family dinners, a Des Moines family removed a kitchen desk and awkward peninsula in their 1911 home to create a cozy breakfast nook. This L-shape design and expandable table fills the bill for family dinners. Bonus: The flip-top bench provides hidden storage. Ornate wood pedestals support a vinyl-clad banquette in the eating nook of Chicago architect Elissa Morgante's kitchen. "I definitely recommend diversity of materials," she says. "It makes keeping a kitchen fresh and interesting easier." 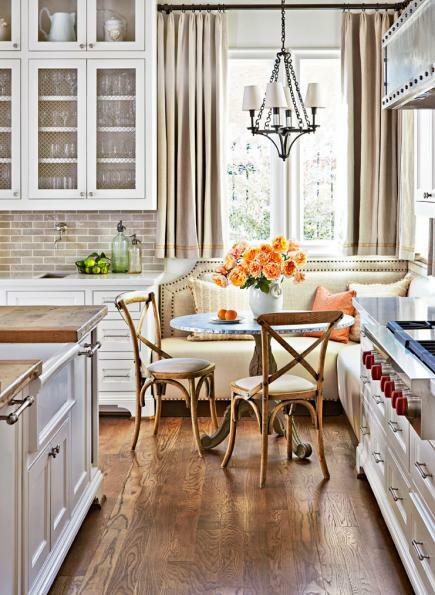 For streamlined style, design a banquette that echoes the kitchen’s cabinetry. A mod corner unit and upper storage mimic the slab cabinet door style. The banquette’s end drawers wear the same hefty hardware. Leather cushions are sleek and easy to clean.